Relative Strength Index or RSI is a popular computer generated technical indicator. An oscillator, is a technical analysis that measures market price momentum such as overbought and oversold conditions. 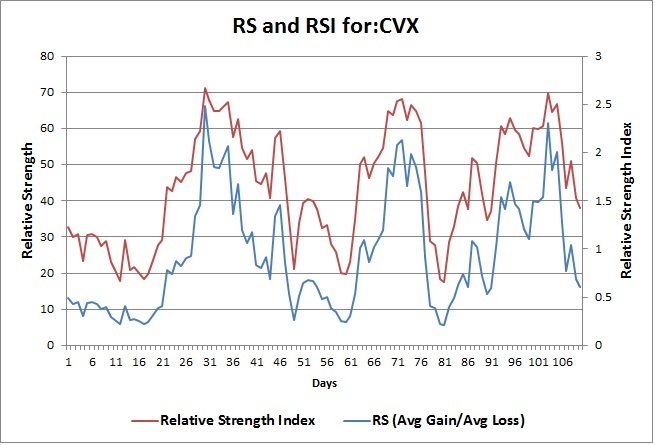 The purpose of Relative Strength Index (RSI) to study a market’s strength or weakness. A RSI reading above 70, is considered as overbought or a weakening bull market. A RSI reading below 30 is considered as oversold or ending bearish market. RSI consist of three parameters – Average Gain, Average Loss, and Relative Strength or RS. The default look-back period is 14 days. Losses are depicted as positive values, and not negative values. 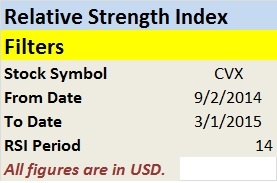 Relative Strength Index measures price changes during the past N periods, where N is the number of trading periods that is fed into the indicator. In this example, you can control RSI periods N. If you set N to 14, it will measure the strength of price fluctuations against previous 13, for a total of 14 periods. If you enter the RSI period for 70 days, you will be measuring price movements for a period of 69 days. The higher the value of N, the slower the indicator will appear to react to recent price movements. The image below shows 2 RSI indicators: the first one is set at 14 days, and the second one at 70 days. Notice that price changes are more erratic when RSI is set to 14 days. This is mainly due to small N value required to calculate the RSI. Relative Strength Index is an oscillator that will read values between 0 and 100. It will show us how strong or weak price has been recorded over the observed number of periods. Typically, a RSI reading above 70, is considered as overbought or a weakening bull market. A RSI reading below 30 is construed by traders as oversold or ending bearish market. Since the indicator can show potential over-bought and over-sold conditions, traders will use RSI as a tool to look for price reversals. A common usage of RSI is seeking to buy the asset once the price goes over the 30 level, with the idea that the price has lifted past the oversold territory with buying strength. The excel spreadsheet attached in this post is fully automated with Web Service enabled VBA and is extremely easy to use. Simply input a stock or an ETF symbol, start and end trading date ranges, and the RSI period (N). The program neatly imports the closing price of the stock for those date ranges, computes the moving averages, RS, and RSI. Finally, it draws the chart – one for the closing price and the other for RSI. Relative Strength Index Plot spreadsheet defaults to 14 for RSI look-back period N. You can raise it to 28 or above to reduce fluctuations. In the same way, N can be lowered to increase fluctuations. 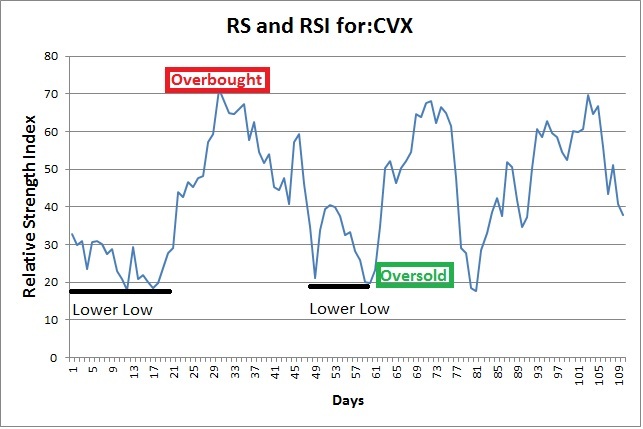 A 14-day RSI has more likelihood of reaching overbought and oversold levels than a 28-day RSI. The look-back parameter depends on the assets’ volatility too. A 14-day RSI for a technology stock such as TWTR (Twitter) will likely hit frequent overbought and oversold levels than 14-day RSI GE (General Electric) or CVX (Chevron Corporation). Short-term traders sometimes rely on 2-period RSI to look for overbought figures above 70 and oversold figures below 30. As always, no technical indicator can be flawless on all grounds. RSI comes with its own share of pitfalls. The main drawback is that the RSI looks for price reversals. Traders often look to initiate buy and sell positions in a range with the RSI. If the market is ranging, this can be a desirable trait in an indicator. However, in a significant downward or upward market trend, the results can be unfavorable as prices continue to move in the trending direction. 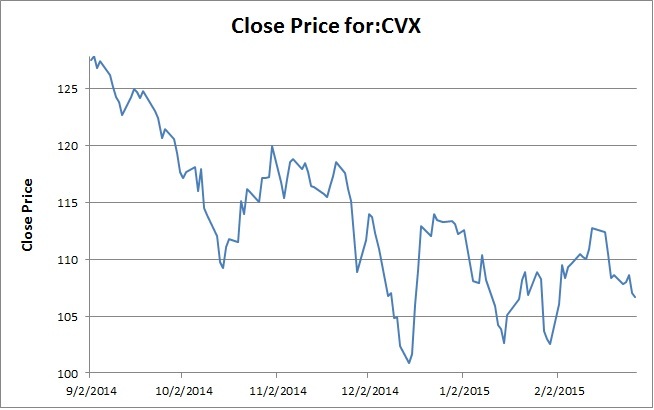 In the case of CVX, those are short positions above 70 or long positions below 30. This can be a loss making deal for traders who have opened trades in the opposite direction.